"In our operations, huge quantities of dust can be released in just a few seconds when trucks are dumping or front loaders are transporting material. We wanted to find a technique that would address the problem in the immediate area, right as it was occurring." An innovative transfer station has mounted an oscillating dust suppression unit on a 20 foot I-beam, increasing reach and effectiveness over the entire tipping area. The unit runs 24 hours, six days a week. Cooper Tank Transfer processes around 1,300 tons of construction and demolition debris per day. The facility has employed several methods of dust control since its opening in 1986, including an extensive perimeter misting system, wind screens, and manual spraying. All provide some benefit, but in the face of tightening regulations and increasing environmental awareness, company officials began investigating advanced technologies to improve dust management even further. To accomplish that goal, the company purchased a DustBoss 30 (DB-30), the smallest in a family of fan driven dust suppression equipment. The versatile unit has a 7.5 HP motor that generates 9,200 CFM of air movement and it features a ring of specially-designed nozzles that atomize the water supply to droplets between 50 and 200 microns in size for maximum particle attraction. The ducted fan design has an adjustable throw angle from 0–50° elevation and oscillates up to 70°. With a throw of up to 100 feet from ground level, it delivers exceptional coverage of more than 5,000 square feet using just a standard 5/8" garden hose. From its elevated perch at the Cooper transfer station, the unit’s reach is far greater. Because of its compact size, the DB-30 can be an extremely effective option for indoor locations or confined spaces. The machine comes with a 1-1/2" pre-filter with quick cam release for easy access, and it can be set up to run potable or non-potable water. Options include single-phase or international motors, carriage mount for easy mobility and a dosing pump for odor control or other additives. The Cooper facility has developed into a well-respected organization over the years, providing a vital service for the waste handling and recycling industries in New York City. Currently processing more than 400,000 tons of C&D waste per year, about 80 percent of its intake is recycled to beneficial uses. Excavators with grapples handle much of the conveyor loading and material is screened twice to remove fines and debris under 12 inches in size, which is processed mechanically. Ferrous metals are removed by magnet, while stone and brick are separated with an air knife. Larger pieces are separated by one of 16 manual pickers on the conveyor line. “Another benefit of the DustBoss is that it doesn’t soak the conveyor or debris pile the way manual spraying does,” said Kvedaras. “Too much water can cause the screens to block up with a mucky residue, which complicates processing and increases maintenance,” he said. According to Kvedaras, the primary benefit is the ability to create a constant mist, without dedicating additional manpower to the effort. 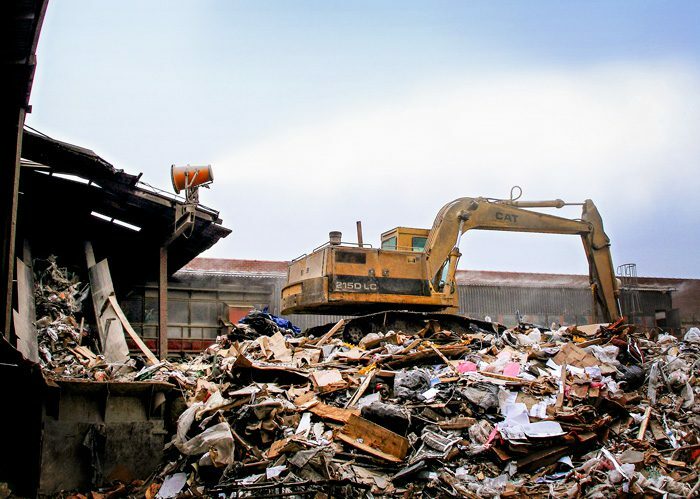 Find a way to control large amounts of dust that can be released very quickly from trucks dumping construction and demolition debris in the tipping area of a large C&D transfer station. The solution had to be extremely reliable, operating three shifts per day without saturating the debris and requiring a minimum of manpower. The DustBoss 30 (DB-30), a portable oscillating ducted fan design that delivers a range of more than 100 feet from its 7.5 HP motor. The unit can blanket over 5,500 square feet (more than 500 meters) from a single position with a fine mist of water droplets that are atomized to the optimum size for particle attraction and dust control. The extremely durable design has been running 24 hours a day, six days a week for over a year, delivering effective dust management to protect workers, commercial neighbors and the surrounding environment. COOPER TANK has served the C&D industry for more than 50 years, originally founded as a manufacturer of boiler expansion tanks and liquid fuel storage tanks. The company later expanded into debris containers for residential and industrial waste removal, including front/rear loading containers, roll-offs and compaction equipment. 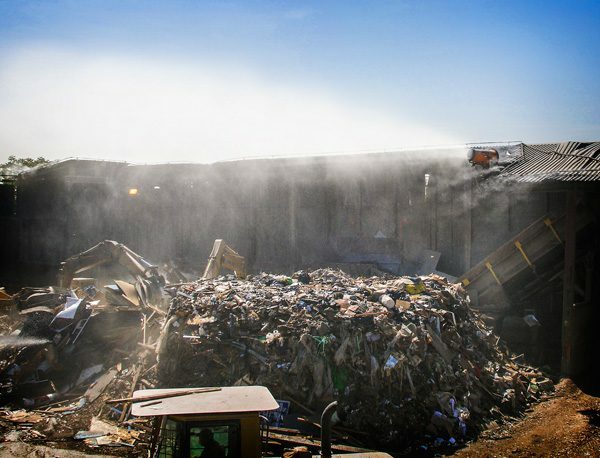 The transfer station has served the NYC area for more than two decades, consistently helping to minimize landfill contributions from C&D operations and improve recycle/re-use rates. This entry was posted in DB-30, Demolition, DustBoss, News, Recycling / Scrap. Bookmark the permalink. Both comments and trackbacks are currently closed.